India Florist: Desiner floral services to Madurai Delhi Mumbai Bangalore Hyderabad Pune. Gift Hampers to India, Hyderabad, Mumbai, Delhi, Bangalore. Presented in one basket filled with goodies. Gift Hampers include mithai, sweets, cakes, cookies, biscuits, dry fruits, chocolates, Plum cake, fresh fruits to India. Gourmet delights. Send flowers to India, send fresh flowers to India Madhya Pradesh, send Valentine gifts to India, best Valentine gifts to India same day. 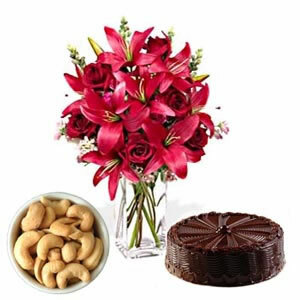 We deliver Flowers, Cakes, Sweets, Chocolates & more other Gifts Same Day at India. We make free home delivery at India. We deliver Flowers, Cakes, Sweets & Chocolates even on Sundays & other Holidays at India. Gifts Galore!! India florist online offers gifts flowers chocolates sweets 5 star bakery cakes hampers exotic flowers and more. Experience the positive reflection of your loved ones far away by gifting them Diwali gifts. Make someone's day special by choosing our floral arrangements combined with cake or chocolates. Show your friendship was a comfort by sending floral sprays. These visibly graceful flowers endowed with bountiful of love will be appreciated with feeling of excitement wrapped in ribbons. Make some ones day bright and cheerful.